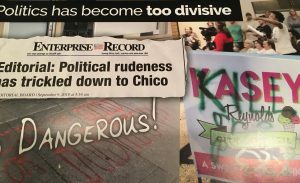 The contribution was first referenced in a campaign flier put out by Chico Democrats as Chicoans mailboxes continue to be flooded with mailers in the lead-up to the Nov. 6 election. In what will probably become the highest-spending campaign in city history — and with partisan control of the Council at stake — more than $300,000 and counting has been contributed to candidates and PACs involved in the race. 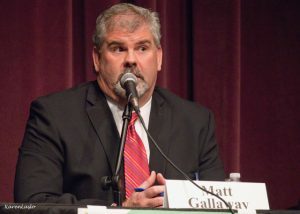 Gallaway, part of a conservative slate running for Council, made the contribution to the PAC, called Patriots for Economic Freedom, in March 2017, about a month before Moore announced his candidacy for the U.S. Senate seat vacated when Jeff Sessions was appointed Attorney General. In November 2017, nine women accused Moore of sexual predation and misconduct, mostly occurring in the late 1970s, and in two cases when the women were teenagers. Moore denied all sexual assault and misconduct allegations. He won the Republican primary but lost the special runoff election to Democrat Doug Jones. He never conceded to Jones. Moore was twice chief justice of the Alabama Supreme Court. He was removed from office in 2003 after installing a 5,000-pound granite monument to the Ten Commandants in front of a judicial building and refusing court orders to have it removed. Moore also was vocal in the birther movement that pushed the false claim that Barack Obama was not born in the United States. During the 2018 election cycle, Patriots for Economic Freedom reported spending $41,000 in support of Moore and $28,000 in opposition to Democratic Sen. Tim Kaine of Virginia, according to OpenSecrets.org, a website of the Center for Responsive Politics. Gallaway did not return phone and email messages inquiring about his contribution to a PAC whose main beneficiary was Moore. A search of the Federal Election Commission website also shows Gallaway contributed $1,500 to the Butte County Republican Party in October 2017. 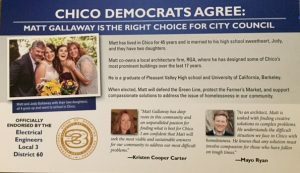 Chico Democrats have reported spending $8,300 on the City Council election in support of Scott Huber, Rich Ober and Alex Brown and in opposition to Gallaway, Kasey Reynolds and Andrew Coolidge. Mailer from local Democrats who support Scott Huber, Rich Ober and Alex Brown. 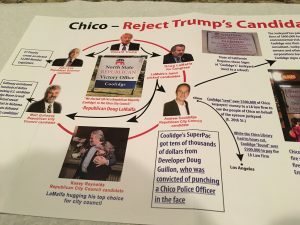 Meantime, the latest mailer put out by a big-spending conservative PAC, Chico Citizens for Accountable Government (CCAG), arrived in some Chicoans’ mail on Tuesday. Mailer from CCAG political action committee that supports Coolidge, Reynolds and Gallaway. 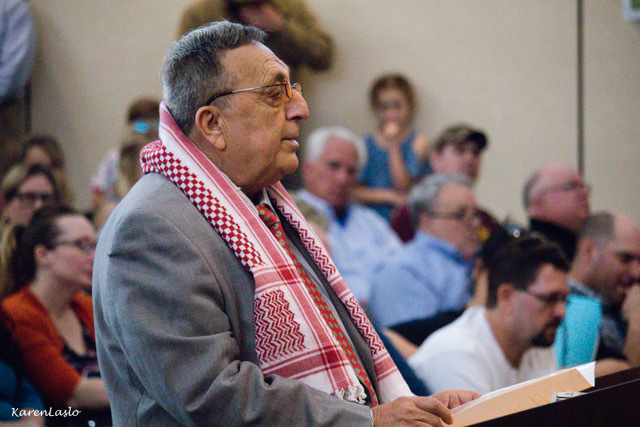 CCAG’s war chest has grown in recent days to a total of $49,000 in contributions, including more donations from business and policing interests. Wayne Cook, owner of the Hotel Diamond and its adjoining restaurant, gave CCAG $2,000 on Oct. 20. On Oct. 25, home-builder Epick Inc. gave the PAC $1,000 on a top of a previous $5,000 donation. 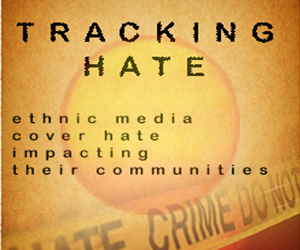 The Peace Officers Research Association of California contributed $2,000 to CCAG on Oct. 25. 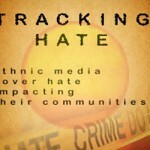 Previously, the Chico Police Officers’ Association had donated $5,000 to the conservative PAC. When you aspire to be a public person and you make that kind of statement with your donation, you are asking to be judged by the company you keep.